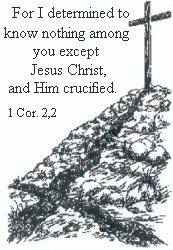 7 In Him we have redemption through His blood, the forgiveness of our trespasses, according to the riches of His grace. 8 which He lavished on us. In all wisdom and insight. 9 He made known to us the mystery of His will, according to His kind intention which He purposed in Him. 10 with a view to an administration suitable to the fullness of the times, that is, the summing up of all things in Christ, things in the heavens and things on the earth. In Him. 11 also we have obtained an inheritance, having been predestined according to His purpose who works all things after the counsel of His will, 12 to the end that we who were the first to hope in Christ would be to the praise of His glory. We read that "in Him we have redemption" (v.7), but what needs to be redeemed? What is in need of it? What is yet unborn. * (In Norwegian redemption and delivery is the same word). When a human being shall leave the condition inside a mothers womb, into a new existence, there has to be a redemption/delivery. And something has to cause this delivery to start. The Word uses the same words and notions when it speaks about being saved. It speaks about a spiritual birth. When a worldly human being becomes Christian, it happens by a birth. The Word speaks about being born again. It says that you have to be born again to be able to see the Kingdom of God (John 3:3), and also to enter into the Kingdom of God. (John 3:5). So, before this birth has taken place, you are spiritually in totally darkness, like a fetus inside the womb. You have just about the same sense, sight and understanding for the Kingdom of God as the fetus has about life outside the womb. It is not possible to see there, because the light cannot come through. If we could have remembered the time when we were born, I think we would have experienced it like if somebody just turned the light on in a dark room. When Jesus, stood on the threshold to this world, it says: “There was the true Light which, coming into the world, enlightens every man.” (John 1:9). The true light! Who enlightens every man! Listen to how the psalmist is praying in this psalm: “O send out Your light and Your truth, let them lead me; Let them bring me to Your holy hill And to Your dwelling places.” (Ps. 43:3). The psalmist has seen his need! No one really cries for the light before he realizes that he is in the darkness. Do you know this cry? Has God answered those who cry? Yes! We know that these were among the many names Jesus had: Light and truth. Let Him lead you! Let Him guide you! Then you will arrive at Gods Holy hill and to His dwelling places. This is the message: Jesus blood and forgiveness of sin which starts the new birth and effects that you goes from death to life. It is worked by God, by the Word when it reaches the heart and conscience with its light. Then a person is born again! The person is being redeemed by being enlighten of the redemption that has been given in Jesus Christ. What do you read here in the Word of God? “In Him you have redemption!” As His blood has made atonement for the sin of the world, so is His forgiveness made perfect for you. Let it work in your heart! It is not you who should consider if this seems fair to you or not. The only thing you can ask, is: Does the Word of God really teach this. And if it does, you will see that also you are saved by Him. When Paul testifies: “In Him we have redemption,” he does not only mean the congregation, but all mankind. Because he points out that this redemption has its cause in His blood - and you probably know the Apostle Johns word: “My little children, I am writing these things to you so that you may not sin And if anyone sins, we have an Advocate with the Father, Jesus Christ the righteous; and He Himself is the propitiation for our sins:” - and then he continues: “- and not for ours only, but also for those of the whole world.” (1 John 2:1-2). It is going to take a whole lot to escape from this! We shall follow this thread for a little bit - so what will it say that he is the Advocate/Spokesman? In the book of Hebrews it says where to and to whom the believers have come, contrary to those who lived and live under the covenant of the law. Then we read: “And to Jesus, the mediator of a new covenant, and to the sprinkled blood, which speaks better than the blood of Abel.” (Hebr. 12:24). What did you hear about the sprinkling blood? - That it speaks! Jesus, our Spokesman, revealed to the throne in heaven, just as a lamb which has been slaughtered, according to the book of Revelation. (Rev. 5:6). Those who say to their spouse: “I love you” and notices that it is called in question, cannot exactly be fully joyful. But we are exactly the same with the Lord, and He has not only told us - which should be enough - but He has visible evidence on the cross of Golgotha. And we go on and on and "wonder if...!" And then we go and try to walk this road that leads to heaven, hopefully “better and better each day”. We show by this that we really have not heard the voice that teaches us, that this road is already walked for us and all the way into the holiness in heaven where He has sat down by the fathers right hand. Therefore it says: "Believe in the Lord Jesus, and you will be saved, you and your household." (Acts 16:31). Notice that it only says one thing: Believe in the Lord Jesus! As you heard from the Word that in Him you have the redemption and in Him your whole house will be redeemed. The new birth is also been made for them, only by this one thing, that the light comes through into their darkness; the light, that God has given us a complete salvation in Jesus Christ. Paul even say, that we were predestined to take part in this salvation, the heritage as he calls it in v.11. So, God had planned out this salvation, and made it for us, before we came into this world! And we had neither done bad nor good. And then we think that everything has to do by what we do, our works! - At least to some extent. No, it is only about what Jesus did. There is only one bad deed - and mark: it is a deed - who shuts us out from all of this and locks it up for us with gates of copper and iron, and that is disbelief. It turns away the Spirit of mercy who has testified to your heart. God has a plan: "With a view to an administration suitable to the fullness of the times, that is, the summing up of all things in Christ, things in the heavens and things on the earth. In Him."(v.10). This is how Paul speaks about it: "We proclaim Him, admonishing every man and teaching every man with all wisdom, so that we may present every man complete in Christ." (Col. 1:28). Not perfect in yourself, but perfect in Christ. In Him, we already have been given the redemption, by His blood, forgiveness of sins. (v.7). There is one thing you should notice in your heart and mind, you who do not want to go astray; the forgiveness of sins is always connected to the blood! Yes, it even says: "And according to the Law, one may almost say, all things are cleansed with blood, and without shedding of blood there is no forgiveness." (Heb. 9:22). You have according to Gods own Word to you a safe foundation to come to. But you have to get to it too. Because the forgiveness of sins is not that God will over and over again decide to forgive you, "for by one offering He has perfected for all time those who are sanctified. "(Heb. 10:14). Which are those who take their refuge in the salvation, the name of Jesus!